Syncfusion is excited to share that PowerPoint to image conversion is now available for UWP applications from 2018 Volume 1 (version 16.1) onward. Before, Essential Presentation supported PowerPoint to image conversion in Windows Forms, WPF, ASP.NET, and ASP.NET MVC. Now, you can convert PowerPoint presentations (PPTX) to images in UWP. This helps with viewing and printing a PowerPoint presentation from Windows desktop and mobile environments. Let’s learn how to convert a PowerPoint slide to an image in UWP. 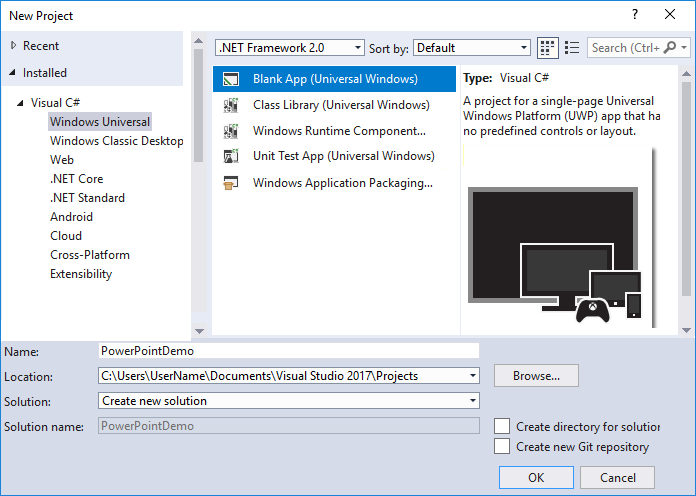 Step 1: Create a Blank App (Universal Windows) and name it PowerPointDemo. Step 2: Choose the target version (Essential Presentation is supported from the minimum version). Step 3: Add the Syncfusion.Presentation.UWP NuGet package as a reference to the project from the Syncfusion UWP NuGet feed. For more information about adding a NuGet feed in Visual Studio and installing NuGet packages, refer to our documentation. You can also install this package from the NuGet package manager console by executing the following command. Step 4: Add an input PowerPoint document to the asset folder. Right-click the PowerPoint document, select Properties, and set its build action as Embedded resource. Step 5: Add a button in the MainPage.xaml. Step 6: Add the following code in the ConvertPPTX_Click method in the MainPage.xaml.cs file to retrieve the embedded PowerPoint file as stream and convert the PowerPoint slide to an image using the SaveAsImageAsync method of ISlide interface. Note: It is mandatory to instantiate the ChartToImageConverter property of IPresentation interface, otherwise the charts will be left blank in the resultant image. //Get the embedded PowerPoint presentation. You can use a file picker to read a file instead. //Load the presentation file from stream. //Get the first slide in the presentation. //Create a storage file to save the converted image. //Convert the slide to an image. You can also generate images in custom sizes by enabling rendering options. The below code example shows how to convert a PowerPoint slide to a thumbnail image. //Set the rendering options to scale the image at 0.25. The default scaling factor is 1. You can also print a PowerPoint presentation by printing the converted images. The images can be printed using the UWP native printer APIs. A simple PowerPoint viewer UWP application can be downloaded, showing you how to display a slide and print the PowerPoint presentation. With PowerPoint presentation-to-image conversion, you can achieve the below functionality in UWP applications. You can convert existing PowerPoint slides or create a slide from scratch and then convert it to an image as required. If you are new to our Presentation library, we highly recommend you follow our Getting Started guide. If you’re already a Syncfusion user, you can download the product setup on Direct-Trac. If you’re not yet a Syncfusion user, you can download a free, 30-day trial.